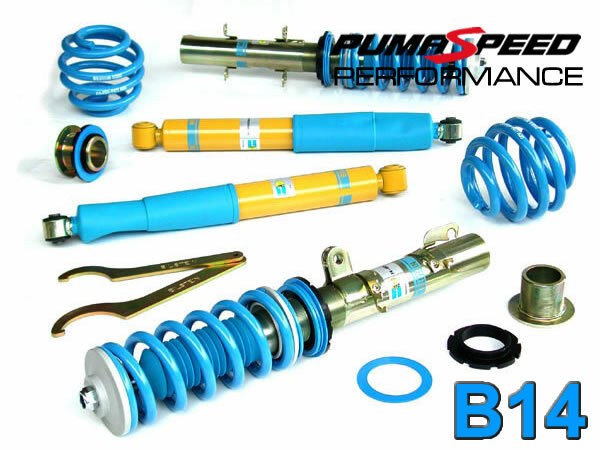 Pumaspeed buying power has enable a bulk purchase of the Bilstein range of suspension. We have 1 x B16 kit for the st225 and 2 x B14 kit for the ST225 available, BE QUICK ,WHEN THEY ARE GONE THEY ARE GONE. The B16 PSS9 Coilover Kits feature adjustable gas pressurised damping. The adjustability of the damping offers a choice of set up, making these kits ideal for different driving styles - decent ride quality for everyday driving use, stiffened damping and set up for weekend trackdays. The triple C Technology used for surface coating gives long lasting corrosion resistance, and the round threads and special alloy spring plates enable easy height adjustment for years to come. Note: Coilover height adjustable units are supplied front & rear where possible. Where rear suspension design does not allow for coilovers, alternative height adjustable or lowered units are supplied. The Pumaspeed Workshop team are ready to fit the Bilstein B14 Coil Over Suspension Kit Ford Focus ST225 in our Head Office located here. Therefore making parts and labour a total cost £901.60 (inc. VAT). Pumaspeed have a specialist distribution team that can dispatch the Bilstein B14 Coil Over Suspension Kit Ford Focus ST225 to any destination worldwide.